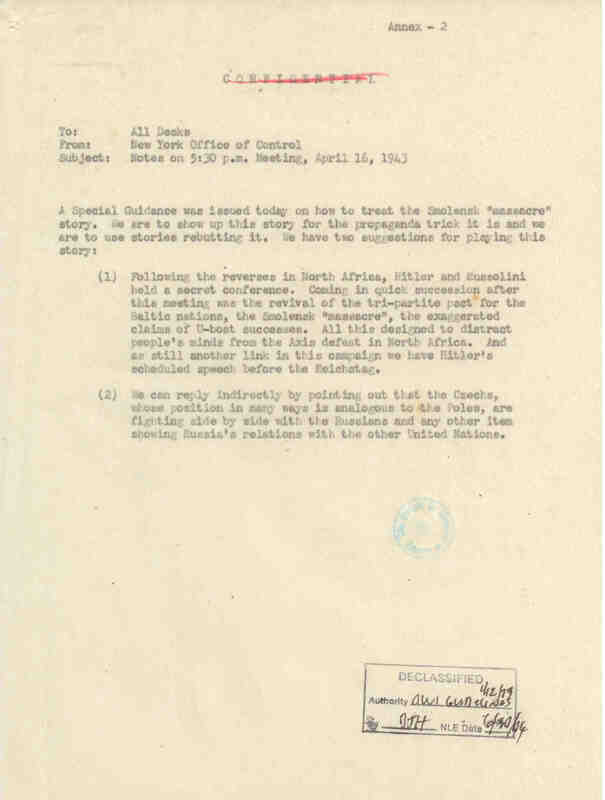 Declassified documents in the National Archives show that a directive issued to on April 17, 1943 by the management of the U.S. Office of War Information (OWI) ordered its Overseas Branch in charge of what were later called Voice of America (VOA) radio broadcasts to air and promote the Soviet propaganda denial of Soviet responsibility for the murder of several thousand Polish officers in the Katyn Forest near Smolensk. Broadcasts of Soviet disinformation by the Voice of America that the Nazi Germans rather than the Soviet NKVD secret police had murdered thousands of Polish POW officers continued throughout World War II with strong encouragement and support from VOA’s pro-Soviet senior officials and wartime broadcasters. They included at least one key pro-communist broadcaster in the Polish Desk, Stefan Arski, who after the war became a chief anti-American propagandist for the Soviet-imposed communist regime in Warsaw. Central directives came from the top leadership of OWI, but the broadcasters were also enthusiastic and willing propagandists for Stalin. 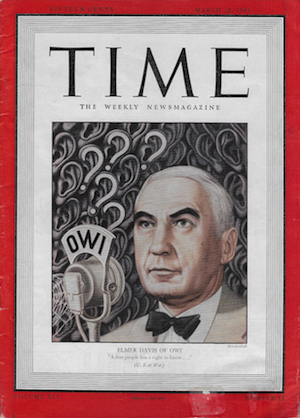 Photo: Elmer Davis, Office of War Information Director, on the cover of Time magazine, March 15, 1943. The name “Voice of America” was not then yet in wide use and OWI radio programs containing false Soviet propaganda news and disinformation were also rebroadcast in the United States. Elmer Davis, whose name is mentioned in the April 17, 1943 directive, was the director of the Office of War Information appointed to his position by President Franklin Delano Roosevelt in 1942. His radio broadcast in support of the false Soviet propaganda claim on the Katyn massacre was also widely rebroadcast on commercial radio networks in the United States. The U.S. Congress, which even during the war objected to such domestic U.S. executive branch propaganda broadcasts, banned in 1948 VOA programs from being distributed in the United States by passing the Smith-Mundt Act which was signed by President Truman. During the war, President Roosevelt did not want Stalin or Soviet Russia, which was then America’s key military ally against Nazi Germany, to be blamed for committing a major war crime against Poland, which, although occupied by the Nazis, was also part of the anti-Nazi alliance with some of its military forces in the Free World fighting alongside the British and the Americans against the Germans . Elmer Davis’ chief deputy in charge of the overseas broadcasts (the Voice of America name was not yet commonly used), Robert E. Sherwood who served as one of FDR’s speech writers, also issued propaganda instructions in support of the Soviet propaganda position on Katyn. He sharply criticized the non-communist Poles in Poland and abroad for not accepting the Soviet explanation for the Katyn massacre and accused them of willingly or unwittingly helping Hitler. The OWI official in charge of overseas radio production, John Houseman, who is described by some as the first director of the Voice of America, also embraced the Soviet propaganda version of the Katyn massacre. Houseman was highly critical of the Poles who opposed Stalin’s plans for incorporating the pre-war territory of eastern Poland into the Soviet Union. After the war, Elmer Davis claimed that he had received no instructions on Katyn from President Roosevelt or the State Department on the handling of the Katyn story. Davis also claimed in congressional testimony on November 11, 1952 that at the time of his wartime broadcast he was absolutely convinced of the German guilt for the Katyn massacre. 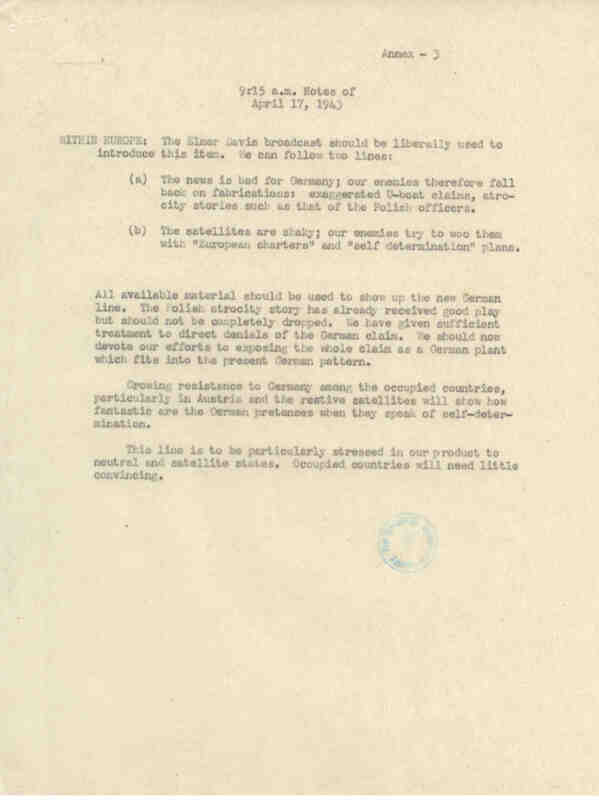 Documentary evidence shows, however, that in April 1943 the State Department advised the OWI not to promote Soviet denials of responsibility for the Katyn murders. Davis’ later claim that he had no idea that the Soviets could have been behind the mass murder is undermined by his own admission that he had received warnings about Soviet Russia and about the pro-communist staff of the Voice of America Polish Desk from Poland’s ambassador to Washington Jan Ciechanowski, Congressman John Lesinski Sr. (D-MI) and other members of Congress. Davis’ congressional testimony showed that he was highly dismissive of both Ambassador Ciechanowski and Congressman Lesinski but he had to admit to members of Congress in 1952 that Stefan Arski, aka Artur Salman, the head of the Czechoslovak Desk Dr. Adolf Hoffmeister, and others working for the OWI during the war were communist sympathizers. Even for several years after the end of World War II, the Voice of America continued limited censorship of Soviet responsibility for the Katyn massacre and only increased its coverage of the story in 1951-1952 after severe criticism in the U.S. Congress. Limited censorship and limiting coverage of the Katyn massacre story in Voice of America broadcasts continued at the Voice of America until the start of the Reagan administration which lifted all such restrictions. The Katyn massacre and the Soviet responsibility for the crime were never censored or limited in Radio Free Europe and Radio Liberty broadcasts which started in the early 1950s. 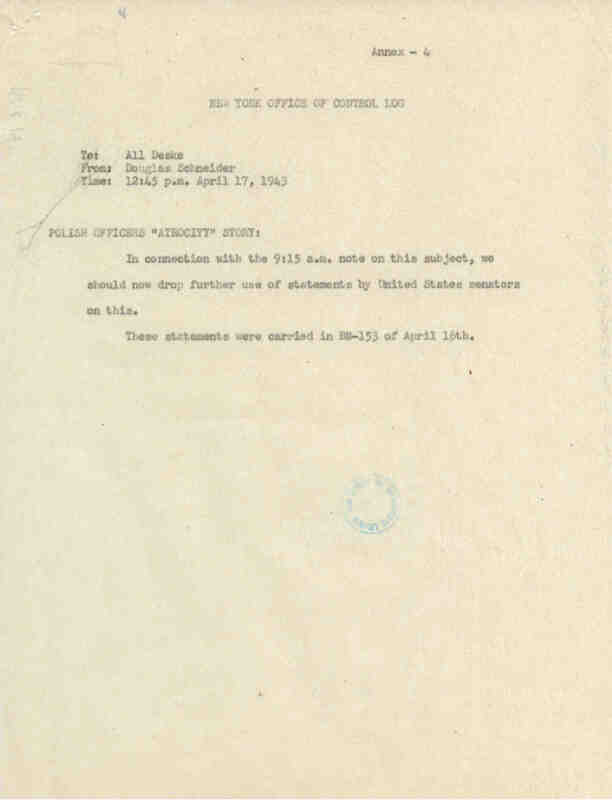 The OWI notes of April 17, 1943 are a classic example of how Soviet propaganda and disinformation achieve success by repetition on the Voice of America, and in this case also VOA’s unquestioned acceptance and support. Elmer Davis set the propaganda tone on Katyn which was then reinforced by various OWI policy directives for Voice of America radio broadcasts and other media outreach. There was no mention in the guidance about any controversy or need for balance. 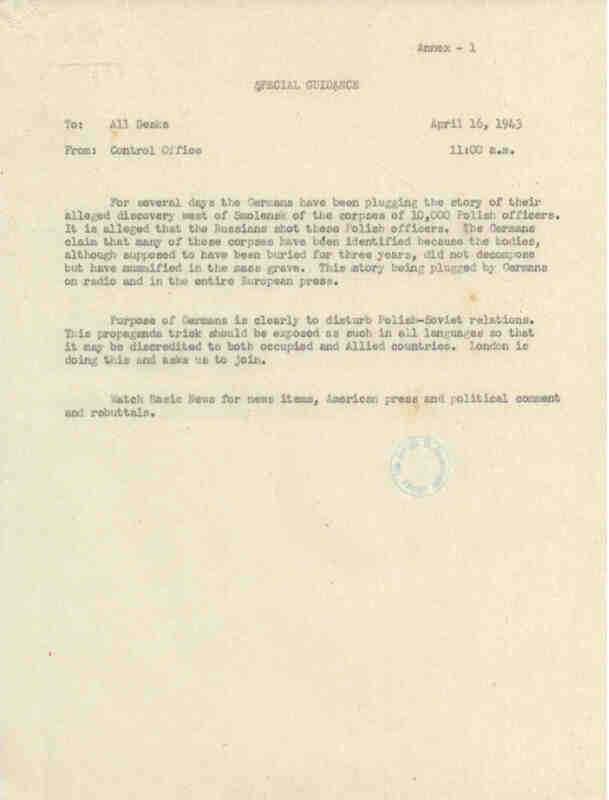 OWI’s 9:15 a.m. Notes of April 17, 1943 urged Elmer Davis’s one-sided broadcast, based on Soviet propaganda and disinformation, to be used within Europe. Many Polish speaking Voice of America radio listeners in Poland, in the Soviet Union (those who could listen to radio) and in the West found these broadcasts offensive and useless, other than presenting the official pro-Yalta, pro-Soviet U.S. position. “On April 17th the 5:30 p.m. notes had the following negative: ‘No further use to be made of Polish atrocity story.’ This decision was taken because the BBC apparently had given only routine coverage to this story which we, by this time, had treated very fully. In the course of the day (Saturday, April 17) a message was received from Mr. Winner in which he questioned the utility of the story and said that it was the feeling of the 2:30 p.m. meeting in Washington that the whole subject was dangerous and had better be dropped. The reference to the story being “treated very fully” meant not balanced reporting but presenting the Soviet version repeatedly. 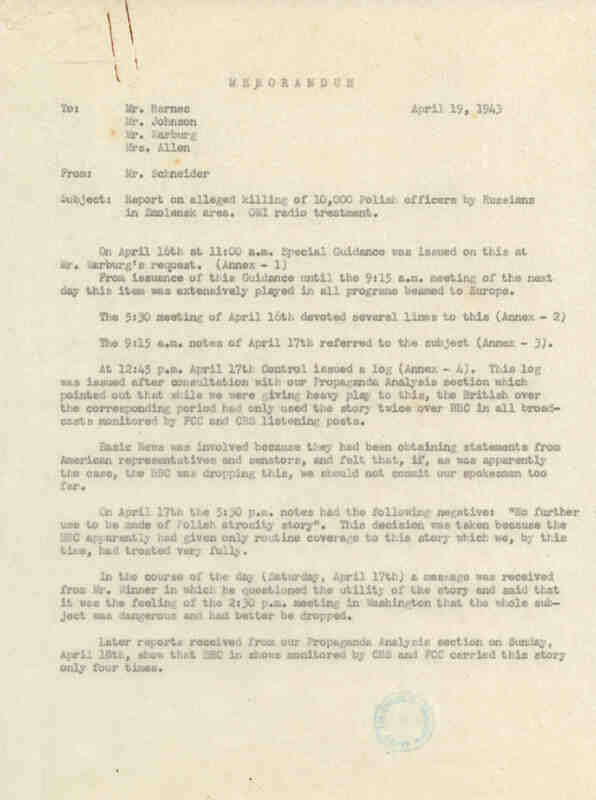 The April 19 memo set the tone for the later Voice of America approach to the Katyn story which was to keep silent about it as much as possible for many years. Ironically, it was exactly the same strategy adopted later by both the Soviet government and the Polish regime in Warsaw. Any references to Katyn were to be suppressed or ignored except in special circumstances. In connection with the 9:15 a.m. note on this subject, we should now drop further use of statement by United States senators on this. city stories such as that of the Polish officers. which fits into the present German pattern. fantastic are the German pretenses when they speak of self determination.